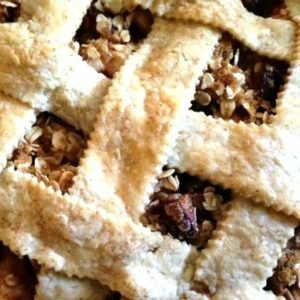 October 24, 2017 0 comments on "Pie Crust Mix"
Do you like homemade pies but hate making homemade pie crust? (That’s me!) I’ve made a lot of pies over the years, but I’ll admit it’s not one of my favorite things to do. I’m always tempted to buy store bought pie crusts when making homemade pie, but it doesn’t have to be hard. With this easy homemade pie crust mix, you can have dough ready for several different pies at once. Combine flour and salt together in a large bowl, mixing well. Cut in shortening with a pastry blender until the shortening is evenly distributed throughout the flour. The mixture will resemble cornmeal. Place mix in a large airtight container like this one. It can be stored from 2-3 months. If you want to store it longer, place 2 1/2 cups mixture in six separate quart sized ziploc bags and store in freezer. This mix can be stored in freezer for up to 1 year. This recipe will make 12 one crust or 6 two crust pies. To prepare pie, mix 2 1/2 cups pie mix with 1 beaten egg, and 1 tbsp. white vinegar. Sprinkle 1/4 c. ice water 1 tablespoon at a time on dough mixture, mixing together with a fork until the dough barely sticks to the sides of the bowl. Divide roll in half and roll out on floured board with a rolling pin. One batch will make two 9-inch pie crusts. Like this recipe? You might also like my recipe for blackberry pie bars.